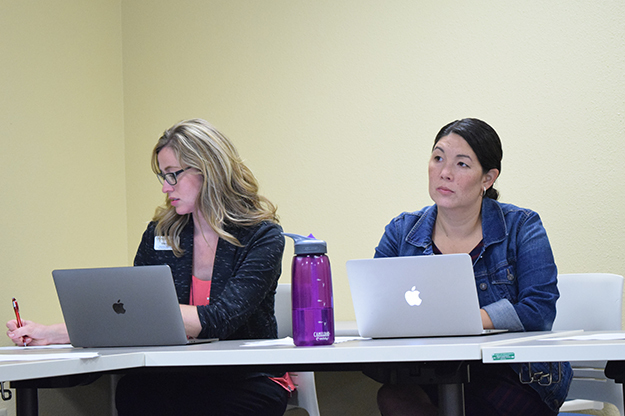 Casey Ozaki (right), a faculty fellow for inclusive excellence and associate professor in the UND Department of Teaching & Learning, alongside Dara Faul, assocaite director of the UND Teaching Transformation and Development Academy (TTaDA) engage in discussion during a recent TTaDA meeting on campus. The leadership of TTaDA has developed the Women’s Leadership Series, a slate of informational events to help and support working professional women on campus. 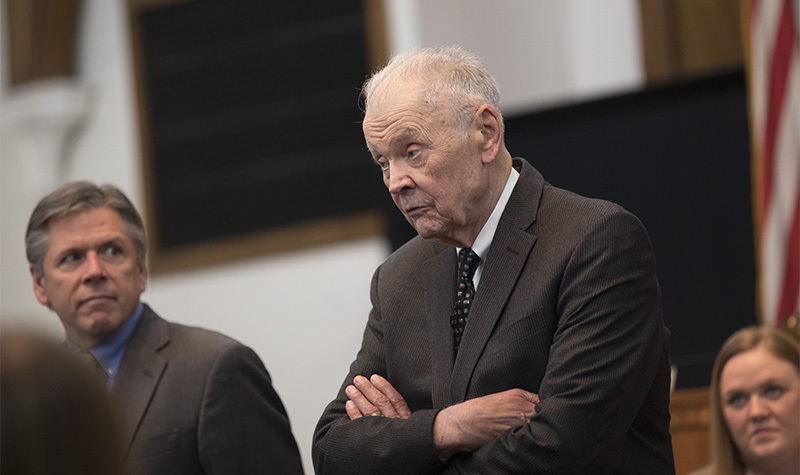 Photo by Dima Williams/UND Today. Anne Kelsch and Carrie Herrig are strong believers in finding ways to support others. 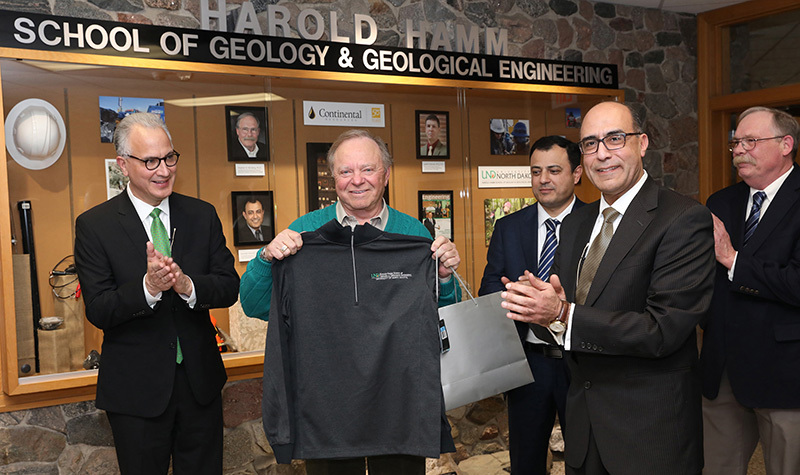 “When so many people have supported you, you want to pay it forward,” Kelsch said. That’s why the director of faculty and staff development at the Teaching Transformation and Development Academy, along with Carrie Herrig, launched the Women’s Leadership Series. The series is open to women and men, faculty and staff, across campus. Kelsch and Herrig said the Series is tied to the One UND Strategic Plan. 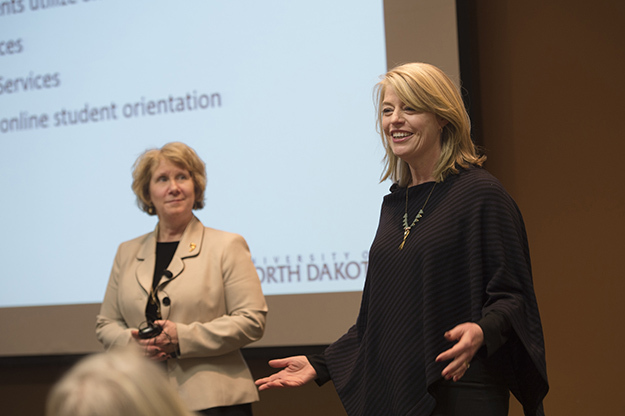 Anne Kelsch (right), director of the Transformation Teaching and Development Academy, and Carrie Herrig (not pictured) pulled together the new UND Women’s Leadership Series last spring in just three months. Photo by Jackie Lorentz. A fall book study launched this week, featuring Grit: The Power of Passion and Perseverance by Angela Duckworth. It runs through Nov. 19 in six facilitated groups with over 85 participants at locations across campus. TTaDa intern Morgan Matson, a senior majoring in Communications, has been instrumental in planning and developing the book study. The longtime New York bestseller is a master class in the components of grit: the combination of passion and perseverance that is common to many successful people. From studies of spelling bee champions to Olympic athletes to her own life as a researcher and mother, Duckworth takes the reader through a fascinating landscape of experiments and experiences, examining the psychological aspects of success. This book study will examine the role of “grit” and what is involved in “gritty” habits. 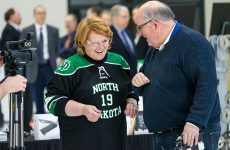 And perhaps most importantly, how to build a culture of “grit” at UND. Sessions will be facilitated by Chelsea Lupien, Dr. Gail Ingwalson, Dr. Anne Kelsch, Anna Kinney, Dr. Adrienne Salentiny, Carrie Herrig, and Morgan Matson. On Nov. 2, TTaDa will sponsor a group to attend the all-day ND WHEN Conference in Minot. The conference theme is “Transition & Transformation for Women in Higher Education” and topics include pursuing career advancement, navigating salary negotiations and campus politics, alternative work schedules and modalities (traditional, online, hybrid), and policy and practices to advance women in higher education. “Advocating for Oneself: Exploring the Power of Influence and Persuasion,” will be held Monday, Nov. 5, 2:30 – 4 p.m., in the Memorial Union River Valley Room. Why do so many women feel uncomfortable advocating for themselves? Gender stereotypes play a role. Many women hesitate to speak up and advocate for themselves out of concern for being seen as aggressive or overly confident. Women also tend to suffer from self-doubt and imposter syndrome – making them more likely to underestimate the value they bring. This session will share ideas about effectively advocating for yourself and navigating your career path though the power of influence and persuasion. Discussion topics include: Finding your voice and confidence, essential skills to getting positive attention from the top down, ways to champion yourself and others, and picking yourself up after set-backs. Participants will have the opportunity to apply their inspirations from the talk to engage with one another and create personal action plans that enhance their self-advocacy. Anyone looking for inspiration to speak up, fully express their gifts, and do what fulfills them will benefit from participating in this program.